Taking on the Pope Et.Al. 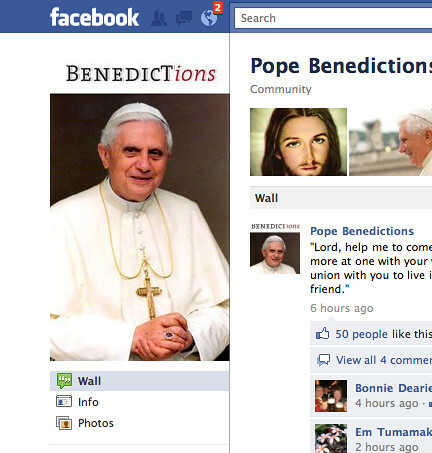 Pope Benedict XVI, among other things for sure, will go down in the tech annuls as the social web Pope. The 265th Pope, who is 84 years old, has launched the Vatican YouTube channel, authorized an iPhone App, Facebook page, and now Twitter account. He as also charged priests to blog as a means to widen their parish and sphere of priestly duties. And the Pope’s handlers have selected the iPad as the Pope’s technology. No doubt for its user friendly experience and, most notably, its cool-factor! It’s interesting to think that a denomination that claims its origins from the original St. Peter, is trying to embrace technology to meet people where they gather…online. They recognize that technology is here to stay and that in order to have a voice, they must participate. Too bad they’re not as progressive about more fundamental issues, like women in ministry and marriage. To be fair, Catholics aren’t the only ones who carve out convenient doctrine and try to enforce it on the masses. Many Protestant denominations also fall short of embracing true equality among men and women or impose rigid doctrine as a one-size-fits-all garment. It’s been a problem for a very long time. But more than just using technology and the social web to get their message out, the user [Pope, clergy, church, temple, mosque, you name it], would do well to heed the fundamental purpose of the social web…to engage. It’s not a one-way communication, but a conversation. That means there is a dialogue; two sides communicating. The social web has opened up a powerful channel for engagement, conversation, dialogue, and connection. The church [and I’m talking about the collective church] already knows how to communicate to. They’ve perfected the practice to an art form. The social web is giving it another opportunity to listen. Which reminds me: God gave us two ears and one mouth. We all would do well to remember that. Forget to mentioned I loved your reply!! Previous PostPrevious Have You Been Tested?